I’ve been planning to write this piece for quite a while… I see it as a tribute to the happiness and quietness Sibiu offers me every day. So here we go, the reasons I fell in love with this lovely Transylvanian town. Bear in mind that, although I will try as much as possible not to, in the end, this will turn into a sort of comparison between living in a big and crowded city like Bucharest and living in a small town like Sibiu. I will start with the obvious and say that Sibiu is smaller. The well-known cliché ‘size counts’ has a rather different meaning here. Living in a smaller city counts in every possible way. Distances are smaller, you get faster everywhere you want, you have more time to actually do other stuff. 15 minutes by car to work in the morning, compared to 50 minutes by metro in Bucharest (by car it would have been around one hour and a half). This is just a simple example of how now I manage to get more sleep in the morning, which is something I just love. 😀 The other good thing about living in a smaller city is that I go out more often in the evening, on working days. 10 minutes by taxi to the city center and here we go, the fun can begin. In Bucharest it was either going out directly from work, either going out during weekends. Sibiu is less crowded. Well, this is actually a consequence of the fact that Sibiu is smaller. Not that many cars, no traffic jams (except for Christmas and Easter when everyone goes insane and tries to conquer the supermarkets and malls). It’s so nice to go to work in the morning and not hear car horns and ambulances all the way. And being less crowded, gets me to the next one. People in Sibiu are calmer. They are more relaxed and sometimes I live under the impression that they are never in a hurry. Which at the beginning got me a bit angry, as I was used to people who always hurried somewhere. Sibiu people drive slower, they don’t flash you to move faster, they don’t horn immediately after the traffic light turns green. And then, maybe another consequence of being calmer. Sibiu people are polite. For real, they actually are. Well, don’t get me wrong, it’s indeed a general statement, but let’s be honest…there are some who I would just love to kill sometimes… But still, Sibiu people are the most polite ones I have seen in Romania, after living in Bucharest. They always say Hello and Thank you, they smile. This happens in stores, in pubs, in clubs and, which might be a bit surprising, in public institutions. Yes, public institutions in Romania always seem to be like hell. You have to get some paper from the city hall or from IRS, prepare to get angry and go home without actually getting the paper. Well, here it’s not the case. You wait politely in line, the employee is smiling, greeting you and actually trying to help you get what you actually came there for. This is one of the things that still manages to amaze me every time I have to go to a public institution. Sometimes I just feel like hugging that employee for being so nice and helpful. Sibiu is cheaper. Now let’s be practical here. Who wouldn’t love to live somewhere where rents are not that high and going out one evening will not mean wasting your entire salary for that month. Eating out and drinking out is way cheaper than Bucharest. And there are places (if you know them) where you just laugh when you see the prices in the menu. Sibiu is cultural. Don’t get me wrong, Bucharest is cultural as well. But sometimes, some of the factors I mentioned above, like crowded and big, keep you from getting to some nice theater play or concert. I don’t think there’s still a need to mention that some years ago Sibiu was the European Cultural Capital and that kind of changed things dramatically and made Sibiu have the name it has today. 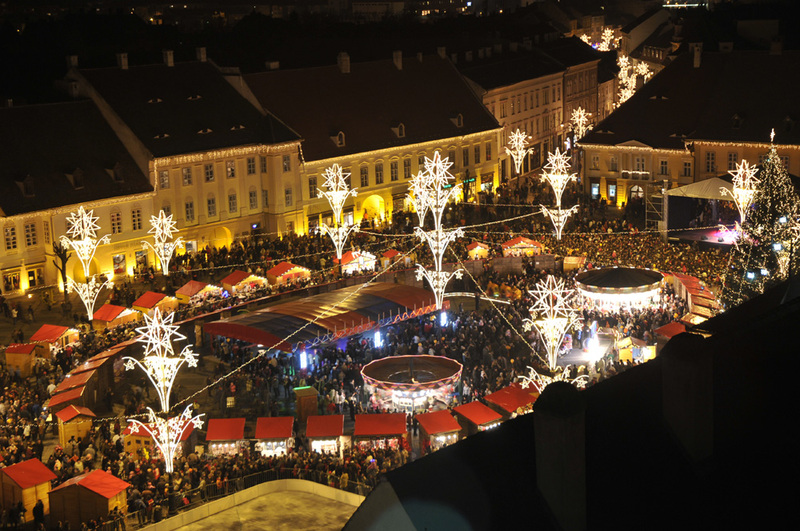 Sibiu has the third most important Theater Festival in Europe, Jazz Festivals, Rock Festivals, Film Festivals, Traditional Festivals, one of the biggest Village Museums in Europe, the Christmas Market, whatever you want, you name it. Not to mention that tickets are quite affordable and this allows people to enjoy all this culture. Summers in Sibiu are full of events. Every weekend there is something happening in this city. From all sorts of music festivals, to theater plays, to outdoor cinemas and to all sorts of sports competitions. Sibiu has it. There are plenty of options to choose from, for every taste. Sibiu is touristic. Especially in summer time, the city is full with tourists. And it’s nice to see that more and more foreign people come to visit Sibiu. I actually quite enjoy going out in summer for a beer on a terrace in the city center and hear so many foreign languages being spoken around me. It’s a popular city and for a good reason. Sibiu looks beautiful, yes it does. It has history, it has parks, it’s a great place to go to for a relaxing city break. The surrounding villages are a good option as well, you have castles, fortresses, churches and you have the chance to see the beautiful country side way of life. Sibiu is all about outdoors. This might be, in my opinion, one of the best things about Sibiu. You have Paltinis, which is a nice ski resort, just 30km from Sibiu. You have cycling tours outside the city, going to the mountains. All you need is good shape and you can enjoy the beautiful surroundings. You are close to the mountains (especially to the Fagaras Mountains – the highest ones in Romania). Which I find so cool and which allows us to go hiking almost all summer long. You have salty lakes where you can go swimming during summer time. Nature is basically at your feet and if one summer afternoon after work you feel like going somewhere for some fresh air, it’s just 30 minutes’ drive away. This is something I didn’t have in Bucharest and carved so much for. But Sibiu has it and the people living here really appreciate this. All winter long they go skiing, all summer long they go hiking or camping or only for a nice picnic. What I especially like about this is that there are so many ocassions when I just drive around the city and raise my head and actually see the mountains so close to me. Especially in winter when there is a clear sky and they are all covered in snow.. the feeling just cannot be described in words, but believe me, it makes me feel like flying. Sibiu food is delicious. I’m not saying that restaurants in Bucharest are not good, because I would lie for sure. But in Sibiu the traditional food tastes really traditional. And for a gourmand like me, that’s more than awesome. You have Romanian traditional food, but you also have German or Hungarian delicious traditional food. Whether you’re into a tripe soup, or a goulash, or a wurst, Sibiu has the perfect places to offer them to you. If we talk about food, I have to mention that, compared to Bucharest, Sibiu still offers some homemade goodies for its people. You have markets, where people from the surrounding villages come and sell fresh vegetables, cheese and eggs, all natural from their own small farms. You cannot imagine how much I love this. Going to the market in summer time is my favorite thing. Especially since they also go in the mountains and they harvest all sorts of forest fruits, mushrooms and medicinal plants. It’s a delight for both the eyes and the soul.